KDC is a small company in the mountains of western Montana producing uncompromising products since 1992. Based on decades of back-country recreation, including hunting, fishing, backpacking, wilderness canoeing, climbing and mountaineering/telemark skiing, I have developed keen appreciation for the requirements of our customer base. Exposure to ultra light, ultra-compact and multi-purpose equipment from the foremost back-country equipment designers over my life has greatly influenced my own designs. Unfortunately, I learned years ago that the gear that addressed my demands, was usually not the gear offered to me at the local boxmart, sporting goods dealer or in the bass-belas catalog. Pursuit of world class back-country gear has directed me to, and exposed me to the products offered by leading retailers like REI, EMS and MEC. When designing the SnipePod V2, I established the following short list of goals. 	It had to be Ultra light weight. 	It had to be very compact in size. 	It had to provide fast and easy attachment/detachment to the firearm in the field. 	It must not limit the shooters ability to pan. (Pan on any axis… Horizontal…Vertical…Canting). 	It had to function equally well in the rugged steep terrain common to my home state of Montana, as it did in the gentlest flat terrain of the great plains. I love light weight gear. I love it more than I probably should but when you are planning on putting some serious miles on your body the lighter you can make your gear the better. This translates to all gear and so it would stand to reason that a light weight bipod/tripod would be a sought after product. Well, look no further friends because KDC has bridged the gap and given us just that. With the V2 Snipe Pod and the 3rd leg attachment you truly have a two for one deal that will put a smile on your face. 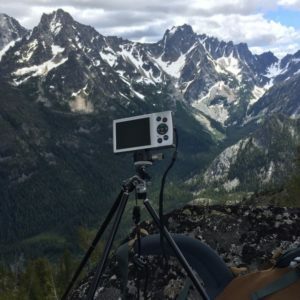 Now KDC also has a designated tripod called the Granite Peak which I have reviewed previously. 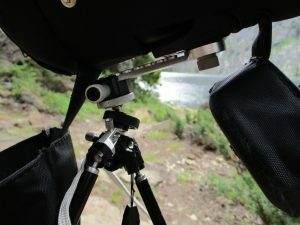 You can read that review here: http://ireviewgear.com/optics/kramer-designs-corporation-granite-peak-tripod-review/ and as you see I had good things to say about this product. So, honestly you could buy both the Granite Peak and the V2 Snipe Pod and still have less weight than a standard mounted bipod. For purpose of this review we will be talking only about the V2 and the additional leg attachment. The V2 Snipe Pod is about as simple as it gets. It attaches to the sling lug that is screwed into the front end of your rifle stock. The attachment point is very simple to figure out and takes only seconds. Once this mount is fixed to your rifle the Snipe Pod can be attached. This is done by simply lining up the holes and pushing the pin through. That’s all there is to it! Once the unit is attached to the firearm you have nearly 80 degrees of rotation with each leg. 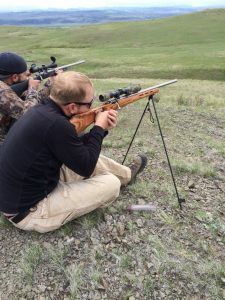 This means that you will have no issue finding a steady shooting platform no matter what the ground condition. The Snipe Pod will give you a feel like shooting sticks. It can be set to its max height or spaced out to allow for lower shots. I have even made shots by pulling apart the legs and shooting from the first section. I will say that this can present a problem for you as dirt or debris can get into the tube but, honestly, it is not intended to be used this way so it is not something that I can say in a negative. What I can say is that this thing is going to provide a fantastic support in almost any type of terrain. Now, as we all know, the shot is the shortest part of the hunt. Sure, having a good shooting support is great but you have to be able to have something to shoot at before that even matters. So, we have to scout, glass, and glass some more. In the past this has meant that we had to dig out our optics and a tripod from the backpack and get to work. Those days are in the past! 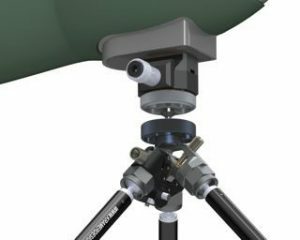 The V2 Snipe Pod has the ability to attach a third leg and become a lightweight and sturdy tripod. This 3rd leg attachment only adds a few ounces to the pack. So to put this into perspective you can have a V2 Snipe Pod, Tripod Conversion Leg, KDC Optics Balance Adjuster (OBA), KDC Rapid Release Shoe, Binocular Tower, and the carrying case all at a fraction of the weight of your typical gun mounted bipod. If that does not peak your interest I am not sure what else I can do for you. Below you will see my 50mm Opticron MM3 sitting on the Snipe Pod with the 3rd Leg and the OBA with the rapid release shoe. Now this amazing set up and all the amazing optional attachments are not without their limitations. This set up is not intended for those huge 85MM spotters or some gigantic pair of binoculars. 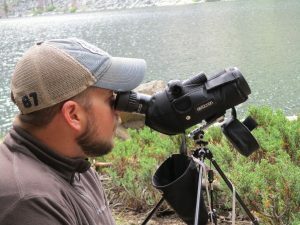 This set up is more of a backcountry set up designed for a compact spotter like an Opticron MM3 or Vortex Razor 50mm. There is also a bit of a learning curve on the adjustments of the setup while trying to pan or follow game as it moves. I would like to see the wheel that tightens the ball joint used for adjustment be just a bit larger so as to be able to get it tighter. 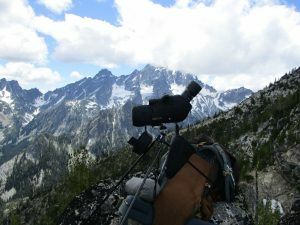 As I said this is going to take a little getting used to, but in the end, I’m sure you will see that this is a fantastic setup for ultralight backcountry hunting. Another great feature of this system is that it can be used as a photography platform. I know it is always a pain to try and find the perfect spot for a camera. I have used sticks, mud, rocks, and backpacks to try and prop up the camera for the best shot. Well, with the rapid release shoe and an additional camera mount this is no longer an issue. I was able to take some great shots while on a recent backpacking trip in the Cascades. I used the V2 Snipe Pod on several coyote stands and a ground hog shoot. I also got out and did some serious shed hunting, scouting, and backpacking with the V2 Snipe Pod and Tripod Conversion kit. I used this as my primary glassing platform and found it to be more than acceptable. 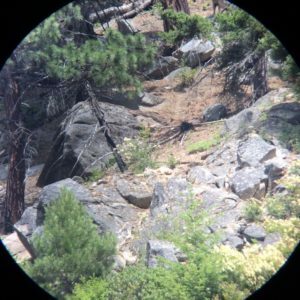 I even got to do a little photography of some goats with my phone and spotting scope attachment. While I would like a little more to grab onto when trying to tighten the ball joint adjustment wheel I cannot really call this a negative point. I did find that sometimes the third leg can be a bit of a bear to get off. The pin has a tendency to stick a little bit and might take some work. The bottom line is that this system works and works well. I cannot see any major areas that need to be addressed. 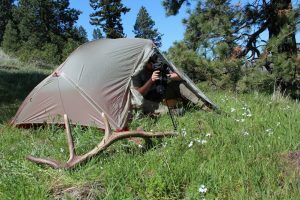 I give the KDC V2 Snipe Pod and Tripod Conversion 5 stars for its innovation and versatility.